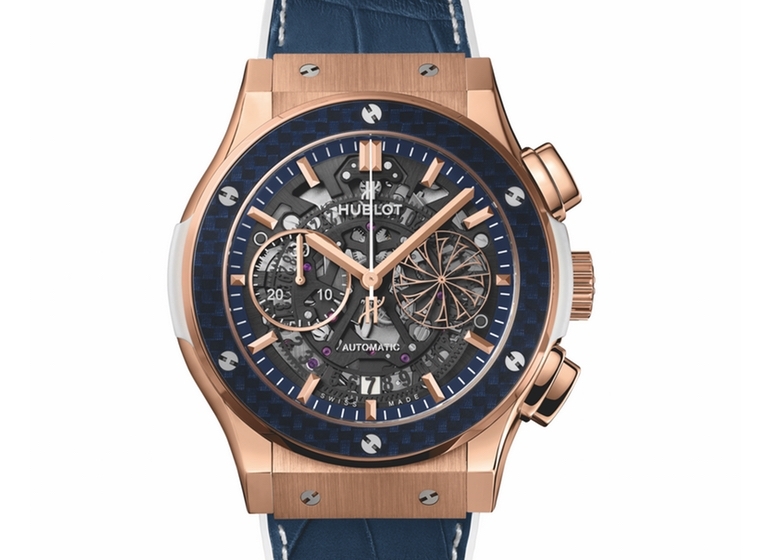 Following the success of the Classic Fusion Mykonos from the last five years (2012 to 2016) and in the presence of Ricardo Guadalupe, CEO of Hublot, John Gofas and Gregory Gofas, the Swiss watchmaking brand is unveiling a new model for summer 2017: even more precious, two-colour titanium and King Gold. Greece. Summer. The Cyclades Archipelago. Mykonos, without question the archetypal Greek island. The famous windmills…Keeping with the theme of blue and white, and again featuring this discreet, elegant little rotating windmill – the symbol of Mykonos – at 3 o’clock, this new chic sports model is 45 mm in diameter and equipped with a chronograph self-winding movement, 207 components, 60 jewels and a 42-hour power reserve.